AMMONNEWS - Prime Minister, Omar Razzaz, hailed the great efforts made by the Public Security Department (PSD) to protect citizens and their property, as Jordan has been become as an oasis of security on the global level. 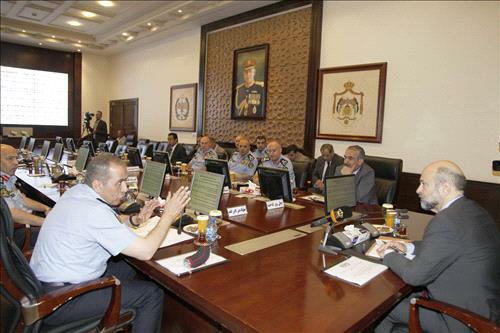 During his visit to the PSD's headquarters and meeting with its Director General, Maj. Gen. Fadel Al-Hamoud and senior officers on Sunday, in the presence of Interior Minister Samir Mubaidain, the premier said the security atmosphere we are witnessing is the result of strenuous efforts in the field by the armed forces, the public security and the security apparatuses. The premier stressed the importance of strengthening the rule of law and applying it to everyone with firmness and justice. Enhancing the prestige of public security and all state institutions is very important and should be based on the system of values, effective citizenship, and the relationship of mutual respect rather than fear, he pointed out. Jordan, he affirmed, is living in a healthy model for how the public security personnel treat the citizen in accordance with the requirements of human rights and the role of the community police. On the anti-drug efforts, the Prime Minister praised the efforts exerted by the PSD in the fight against drugs, and highlighted the importance of coordinating public security endeavors with the Ministries of Education, Higher Education and Social Development to combat this phenomenon and its devastating effects on society and human health, mind and productivity. The Prime Minister praised the development and modernization the PSD is witnessing, which is based on a scientific basis, carried out in accordance with "a correct methodology," with its results being reflected on the ground. He said the security apparatus is an example to follow suit by all institutions in the public sector in the field of strategic planning accomplished in accordance with clear goals. The premier was briefed on the PSD's plans for the 2018-2020 and the restructuring strategies to increase effectiveness of police-based performance and to further expand field services offered to citizens. At the end of the visit, Razzaz toured the Command Center and listened to an update on its advanced services as new visual technologies are integrated. The Interior Minister, Samir Mubaidain, highlighted the "magnitude" of the tasks carried out by the public security apparatus, praising the professionalism of its cadres as embodied in the coordination with other security services within the common security system. The minister stressed the importance of supporting the public security apparatus to enable it carry out its duties towards citizens fully. For his part, Director General of the PSD Maj. Gen. Fadel Al-Hamoud said the department is "always seeking to enhance the services provided to citizens," and noted " we constantly improve and upgrade our work and add new services relying on the citizens' needs in the fields of policing, security, social and humanitarian work. The work of the PSD in the next phase is based on strengthening the rule of law and implementing it to all without prejudice or discrimination and providing service to citizens "wherever they are with the least effort and the shortest possible time," he noted. He highlighted keenness to revive the concept of community policing in which the citizen is an effective partner to the police cadres, in parallel with ramping up efforts to control and prevent all forms of crime.